Buddha meditated under a Bo-Tree plant, for 7 weeks, to achieve enlightenment. Attractive and well formed with bluish green leaves. Excellent as an indoor plant like Ficus benjamina. Anti-bacterial properties. 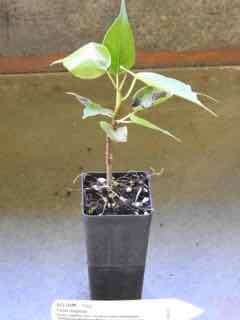 Bo-Tree, Ficus religiosa, is native to India and prefers rich, moist soils in a protected, partly shaded position. Drought and frost tender. A deciduous tree, growing to 30m x 6m.